In support of their February 23rd release of ‘Misery Rites’, WAKE have announced a string of tour dates that lead them through Canada and the United States, beginning on March 10th. 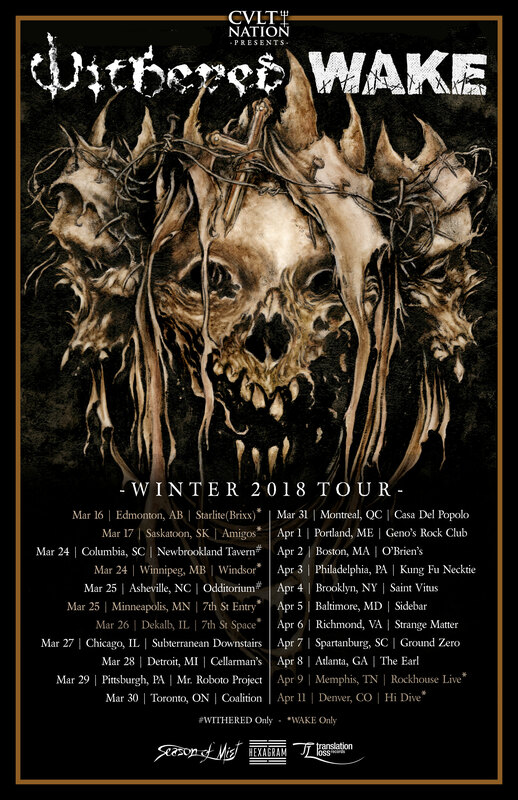 WAKE will then join blackened death/doom powerhouse WITHERED (Season Of Mist) on March 27th, which will lead them throughout the United States and Canada for 13 dates, delivering harrowing death-grind along their path. The tour is sponsored by CVLT Nation, Hexagram Booking, Season of Mist, and Translation Loss Records. Few metal heads would say the name WAKE isn’t synonymous with “relentless”. Over the last decade, consistent ethics, back-to-back tours, and a veritable stream of releases have turned this humble grinding metal outfit into a Canadian institution. In support of their February 23rd release of Misery Rites, WAKE have announced a string of tour dates that lead them through Canada and the United States, beginning on March 10th. WAKE will then join blackened death/doom powerhouse WITHERED (Season Of Mist) on March 27th, which will lead them throughout the United States and Canada for 15 days, delivering their harrowing death-grind along their path. The tour is sponsored by CVLT Nation, Hexagram Booking, Season of Mist, and Translation Loss Records.